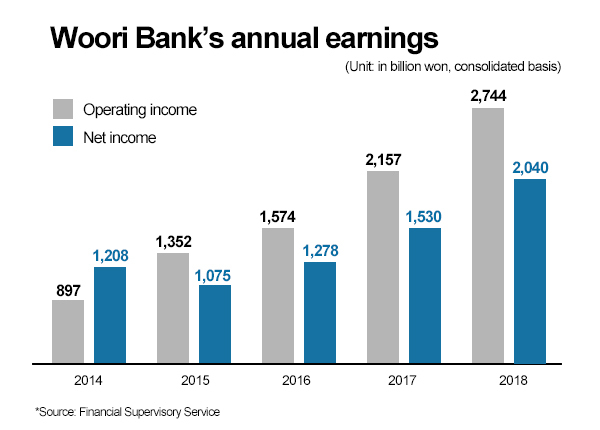 South Korea’s Woori Bank reported best-ever earnings last year - over 2 trillion won ($1.78 billion) in net profit thanks to high interest income - as it heralds a new start as the flagship of Woori Financial Holding. Woori Bank said in a regulatory filing on Monday that it posted record net profit of 2.04 trillion won on a consolidated basis for full 2018, up 33.3 percent from a year ago. The lender’s operating income also jumped 27.22 percent to 2.74 trillion won even as revenue fell 16.05 percent to 19.92 trillion won. Woori Bank’s return on equity reached 9.6 percent last year. Woori Bank’s strong performance was mainly attributed by a surge in interest income, which increased 8.2 percent to 5.65 trillion won in 2018 from a year ago. The bank’s high income from interest came on a rise in volume of loans to small- and mid-size businesses which increased 6.5 percent over the cited period. Low-cost funding also increased 5.9 percent, establishing a foundation for asset and profitability growth. Woori Bank’s global business also raised over 200 billion won in net profit last year, up 19.7 percent from a year ago. Woori Bank, meanwhile, raised 1.05 trillion won in non-interest income last year, down from 1.25 trillion won in the previous year. The bank said income fell on relative terms as securities sold in 2017 ahead of adopting International Financial Reporting Standards 9 were reflected in last year’s financial sheet. Woori Bank’s earnings from commission fees jumped 4.8 percent last year from a year ago. It also achieved high income from trust and profit-making securities amid efforts to focus capability on asset management. The lender’s corporate investment banking and derivatives division also raised favorable results that helped boost non-interest income. Woori Bank’s asset soundness continued to improve thanks to its operations that focus on high-grade assets. The company’s non-performing loan ratio (NPL) fell to record low level of 0.51 percent and default rate improved to 0.31 percent. Woori Bank shares, meanwhile, have been put to a trading suspension from Jan. 9 to Feb. 12 as it is expected to convert into a holding company.